Description: Vous êtes addicts à la bonne viande mais votre meilleur ami vient de rejoindre le camp des vegan et des végétariens. Fini les prises de tête et la susceptibilité ! 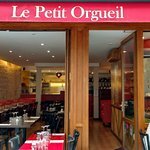 La cuisine du Petit Orgueil prend en compte les goûts et les convictions de tout le monde ! 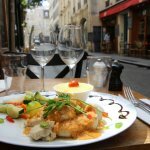 Une cuisine typiquement française, généreuse et créative à savourer pour les pauses dej’ où les dîners conviviaux ! 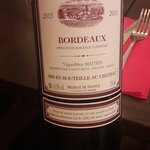 Une cuisine préparée sous vos yeux à partir de produits bruts et frais, une petite salle aux murs de pierres apparentes et une atmosphère chaleureuse sont des atouts pour cet établissement qui peut s'enorgueillir de beaucoup de convivialité et d'authenticité! The lamb was amazing, tender and full of flavor. Pear with wine dessert also spectacular. Service was kind and thoughtful. In terms of service I can’t fault this restaurant. The waitresses took time to explain the menu in detail because there wasn’t an English menu. (Shame on me). I had the scallops to start and there came with a delicious creamy and tasty sauce. 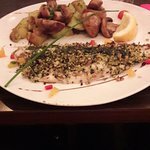 For my main course I had sea bass which was coated on top with pine nuts and herbs. It was served with a great combination of sautéed potatoes and mushrooms. Accompanied by a glass of white wine, this was a wonderful meal and “the Fork” discount was an added bonus. I think I have never seen, in all the places I have visited, such a concentration of restaurant and should I say food factory for a big number of them. Trendy one day, old fashioned 3 months later. So it was a very nice surprise to find this tiny place, which is a real restaurant. We had a very nice meal (desserts are very tasty). The wine is normally priced and the waitress we had this night was as kind as efficient. Be careful for the two tables outside, the narrow street is open to cars (although the traffic is not heavy) and you may be annoyed by noise, smoke... If you visit Paris, you will most certainly visit Les Halles, so I recommend this place for lunch or dinner. Like many people we were looking for a NON tourist trap and this is located just off the major dining street of Montorgueil. They open at 6:30pm and we were the first there and had great quality time with Katia (I think) whose partner is the chef. 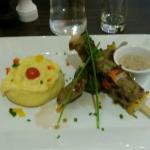 We had a 2 course special and no alcohol and it was the best value and great quality that we had while in Paris. I had lamb shank with mashed potatoes. I was quickly in my “happy place”. 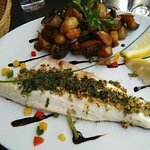 My wife had filet of fish and though the portion was just half the fish, it was a perfect sized portion for her. 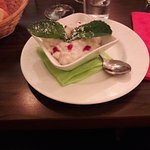 We had pear salad to start which was fantastic and we shared a mousse with baileys at the end. The mousse wasn’t super good but our expectations were probably too high based on the first 3 dishes. I love to see young people working with and following their passion and this restaurant seems to clearly know it’s niche. 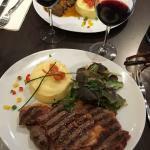 Good French food, with simple and small menu that they prepare well. They are not trying to be all thing to everyone. Worth a try for sure. Imagine that you are a party of 6 traveling together with one vegan, one vegetarian who also eats fish, one picky eater who doesn’t eat meat but does eat chicken only if there are no bones, one who doesn’t eat garlic and is careful about too many vegetables and two who want to try everything. Where do you dine? Right here. A pretty restaurant with an open air terrace and an innovative vegetarian friendly menu but also with meat and fish entrees. We had a perfect meal. It was innovative, lovely and delicious. Everyonr was happy and the price was reasonable. If you are in the 2nd this is the place to dine. 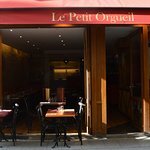 Been to Le Petit Orgueil? Share your experiences!